Wireless earphones are electronic devices worn by individuals in the ears to listen to music, the radio, or telephone communications. They are connected to devices via Bluetooth and Wi-Fi technologies. They provide audio output to devices such as television, mp3 players, radio, tablets, and mobile phones. The adoption of wireless technology-enabled solutions has increased rapidly in the recent past, as they offer convenience, especially in terms of portability. Wireless technologies such as Bluetooth, Wi-Fi, WiSA, and AirPlay are now used for audio transmission between devices. This factor is expected to drive the wireless earphone market during the forecast period. The global wireless earphone market has been segmented based on type, connectivity, application, market type, distribution channel, and geography. Based on type, the market has been classified into ear bud earphone and canal earphone. Canal earphones are preferred over earbud earphones for sports & fitness and music & entertainment applications. Canal earphones have form-fitting rubber tips, which increase comfort and provide superior isolation from outside noise as well as increased bass response. In addition, canal earphones are easy to fit and convenient. These factors are expected to boost demand for canal earphones during the forecast period. In terms of connectivity, the wireless earphone market has been classified into Wi-Fi and Bluetooth technology. Bluetooth is the most common and preferred connectivity type in the wireless earphone market as compared to other technologies. Wireless connectivity technology offers various advantages such as mobility, easy installation, and less cost. All these advantages are likely to increase the market attractiveness of wireless connectivity technology in the coming years. Based on application, the wireless earphone market has been categorized into music & entertainment, sports & fitness, and gaming & virtual reality. The sports & fitness segment held a major market share in 2017. It is expected to maintain its market share during the forecast period. The music & entertainment segment is expected to expand at a rapid pace. In terms of distribution channel, the market has been split into online stores and offline stores. The offline stores segment has been further divided into hypermarkets/supermarkets, multi-brand electronic stores, exclusive showrooms, and others. Online retail stores is likely to be a highly attractive segment during the forecast period, owing to a rise in preference for online shopping in recent years. Based on market type, the wireless earphone market has been classified into mobile inbox market and mobile aftermarket. The mobile aftermarket segment holds a major share of the global wireless earphone market. Currently, mobile manufacturers offer wired earphones with the mobile inbox. However, companies offer wireless earphones separately to customers. This is expected to drive the mobile aftermarket segment in the coming years. In terms of region, the global wireless earphone market has been segmented into North America, Europe, Asia Pacific, South America, and Middle East & Africa. The market in North America is driven by an increase in smartphone users, technological advancements in wireless earphones, and unmet need of consumers. Demand for wireless earphones in developing regions such as Asia Pacific and Middle East & Africa is expected to increase significantly during the forecast period. Manufacturers are expanding their product lines to meet demand for wireless earphones. Moreover, strong product innovation and addition of newer features are expected to boost the market. Asia Pacific is likely to be a highly attractive region of the market, owing to the steady adoption of wireless earphones. Manufacturers are keen on entering the market in Asia Pacific in order to expand their foorprint in the market in the region. North America and Europe are likely to dominate the global wireless earphone market owing to the preference for premium brands among the population in the regions. The wireless earphone market is fragmented, due to the presence of several players. Competition is expected to intensify in the coming years, due to the entry of several local players. Key companies profiled in the research report include Skullcandy, Harman International Industries, Sennheiser electronic GmbH & Co. KG, Plantronics, Inc., Bose Corporation, Sony Corporation, Jabra, Koninklijke Philips N.V, Apple Inc., Samsung, Motorola Mobility, Huawei Technologies Co., Ltd, Bang & Olufsen, Edifier International Limited, Panasonic, Shure Incorporated, Xiaomi, Nokia, LG Electronics, Inc., OnePlus, and Motorola mobility (Lenovo Inc.). The report also offers the competitive landscape of the key players in the global wireless earphone market. The report on the wireless earphone market provides analysis for the period 2016–2026, wherein the period from 2018 to 2026 is the forecast period and 2017 is the base year. The report covers all the major trends and key drivers playing a major role in wireless earphone market growth over the forecast period. It also highlights the drivers, restraints, and opportunities expected to influence the market’s growth during the said period. The study provides a holistic perspective on the wireless earphone market’s growth throughout the above mentioned forecast period in terms of revenue (in US$ Mn) and volume (in Thousand Units), across different geographies such as Asia Pacific, South America, North America, Europe, and Middle East & Africa (MEA). A rise in the number of smartphone users has resulted in a rise in demand for different types of wireless earphones. The purchasing power of young consumers is increasing, and they are able to differentiate between various wireless earphone features. Moreover, the emphasis on comfort and performance of earphones for various applications such as music & entertainment, sports & fitness, and gaming & virtual reality has increased. As a result of this, more and more athletes and sports enthusiasts choose to purchase wireless earphones. These factors are expected to drive the global wireless earphone market from 2018 to 2026. Rise in the adoption of wireless connectivity technologies and increase in the popularity of wireless earphone with noise cancellation technology are expected to drive the wireless earphone market during the forecast period. In addition, the introduction of innovative shapes and sizes and additional features for increased usability are likely to boost the market. The report segments the global wireless earphone market based on type, connectivity, application, market type, distribution channel, and geography. Based on type, the market has been classified into earbud earphones and canal earphones. In terms of connectivity, the market has been categorized into Wi-Fi and Bluetooth technology. Based on application, the market has been divided into music & entertainment, sports & fitness, and gaming & virtual reality. In terms of market type, the market has been classified into mobile aftermarket and mobile inbox market. Based on distribution channel, the market has been segmented into online stores and offline stores. The offline stores segment has been further divided into hypermarkets/supermarkets, multi-brand electronic stores, exclusive showrooms, and others. The market in North America has been divided into the U.S., Canada, and Rest of North America. Similarly, the market in Europe has been classified into Germany the U.K., France, and the Rest of Europe. Asia Pacific has been segmented into China, Japan, India, and the Rest of Asia Pacific. Middle East & Africa covers the G.C.C. countries, South Africa, and the Rest of Middle East & Africa. Similarly, South America includes Brazil and the Rest of South America. This report provides all the essential information required to understand wireless earphones and their types. The report also includes key developments in the wireless earphone market. Porter’s five force analysis, which identifies the bargaining power of suppliers, bargaining power of buyers, threat from new entrants, threat from substitutes, and degree of competition in the wireless earphone market industry, is also included in the report. Value chain analysis, which shows work flow in the wireless earphone market and identifies raw material supplier service providers and distribution channels of this industry, is also covered in the report. Segment trends and regional trends have also been highlighted. The report also covers segment-wise incremental opportunity analysis and price trend analysis (retail price). Furthermore, the report covers incremental opportunity analysis and identifies and compares segments’ attractiveness on the basis of CAGR and market share index across North America, Europe, Asia Pacific, Middle East & Africa, and South America. The same has also been provided for each segmentation category i.e. type, connectivity, application, market type, distribution channel, and geography in the scope of the study. The report also covers region-wise share analysis of the wireless earphone market. 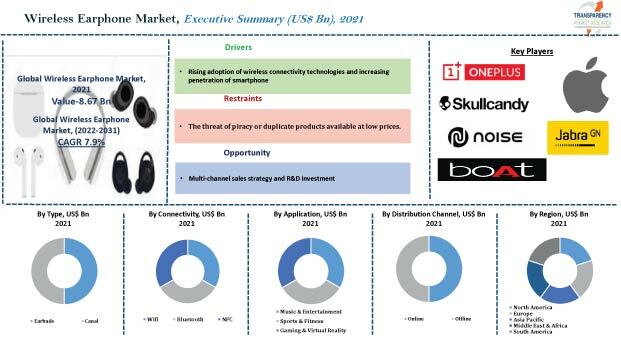 The report also includes the competition landscape, which comprises the competition matrix, market share analysis of major players in the global wireless earphone market based on their 2017 revenues, and profiles of major players. The competition matrix benchmarks leading players on the basis of their capabilities and potential to grow. Factors such as market position, offerings, and R&D focus are attributed to companies’ capabilities. Factors such as topline growth, market share, segment growth, infrastructure facilities, and future outlook are attributed to companies’ potential to grow. This section also identifies and includes various recent developments carried out by leading players in the wireless earphone market. Some of the major players operating in the global wireless earphone market profiled in this study are Sennheiser Electronic GmbH & Co. KG, Plantronics, Inc., Bose Corporation, Sony Corporation, Jabra, Koninklijke Philips N.V, Apple Inc., Samsung, Motorola Mobility, Huawei Technologies Co., Ltd, Bang & Olufsen, Edifier International Limited, Panasonic, Shure Incorporated, Xiaomi, Nokia, LG Electronics, Inc., OnePlus, and Motorola Mobility (Lenovo Inc.). Details such as financials, business strategies, recent developments, and other such strategic information pertaining to these players have been duly provided as part of company profiling.